Patio dog doors can be a great option for pet owners who'd like the convenience of having a way for Rover to let himself in and out but are not in love with the idea of cutting a hole in their home. 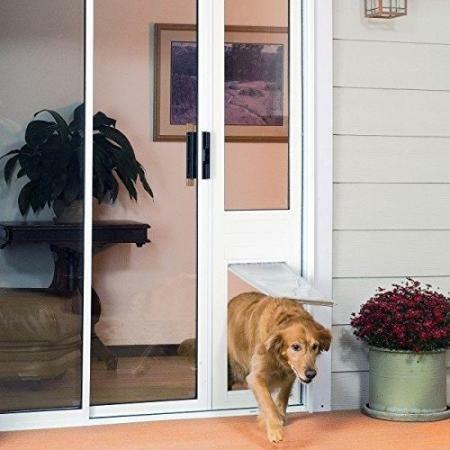 A patio dog door can be added to any existing patio door system since the entire unit fits within the door track to become part of the door itself, complete with a locking mechanism. Temporary dog doors are designed to be easily installed and removed from the patio door frame. These units are ideal for pet owners who either do not want a dog door available at all times or are worried about security when they travel. These doors are also ideal for renters who can easily remove the doors when their lease ends. Semi-permanent dog doors are designed with a lock unit that must align perfectly with the patio door bracket. Consequently, the unit must be securely screwed in place with mounting hardware. You can still remove the unit; it just takes a little more work. Note: Both temporary and semi-permanent style patio dog doors are also available with manual or automatic door flap options. It's crucial that the dog door you ultimately purchase fits both your patio door construction and your pet to ensure a safe way for your dog to get outside. Patio dog doors are not one-size-fits-all because there is no standard size patio door. Your first step will be to measure the door opening from top to bottom on the inside of the door's track. This will give you the exact height of pet door your opening will accommodate, and you will use this measurement to help you select a patio dog door with an adjustable height range that falls within your dimensions. The rise refers to the height at the bottom of the doggy door that your dog will have to step over to get outside. Some dog doors come with an adjustable rise; others do not, so you need to check this dimension on any unit you're considering with respect to how tall your dog's legs are and how easily they will be able to step over it without straining. The lower the rise, the easier it will be for them to step over. Your next step will be to measure your dog to make sure he'll fit comfortably through the flap opening. Measure your pet's height from the floor to their shoulders. This will determine how high the top of the pet door flap needs to be from the ground to keep your dog from having to crawl through it. Also, measure the width of his body to make sure he won't have to squeeze through the entry. Your dog should be able to comfortably fit through the door. Choosing patio dog doors can be difficult because there are so many models available. 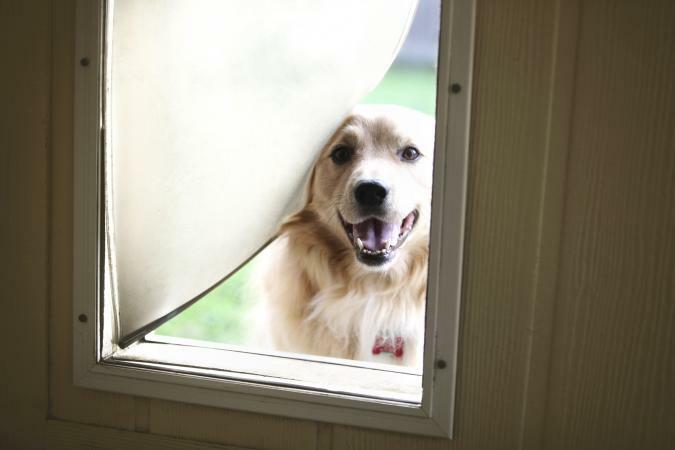 The quality of a dog door varies from one manufacturer to the next, so carefully compare materials, installation difficulty, and purchase guarantees before you buy. VIP Patio Pet Doors from Ideal Pet Products - This semi-permanent patio door is designed specifically for owners with vinyl sliding doors. The door is divided into two window panes, with the lower pane using an UltraFlex flap that opens as a dog pushes through and closes shut behind them. A locking panel is available for days where you don't want Fido to have access outside without your supervision. A variety of sizes are available, with prices ranging from $338 - $541. EnduraFlap Thermo Panel 3e Pet Door - No tools are required to install this door; the door stays secure with a spring-loaded design. The flap rotates itself on a rod to prevent stress on one particular area and keeps it from wearing down. Four flap sizes are available, and heights are customizable. Over 150 customers on PetDoors gave this patio door a 4.5-star rating, citing that it is well insulated and made of quality materials. Prices begin at $419. Hale "Omni" Panel Pet Doors - Fit for a high-end home, this custom luxury patio dog door features double pane glass and fits directly into the slider for glass siding doors, and double flaps through the doggy door ensure energy efficiency year-round. The door has a custom lock bar but is still easily removable. Pricing begins at just under $860. PX-SG Series High Tech Pet Power Pet Electronic Door- This electronic dog door fits into your sliding glass door and works using ultrasonic waves from your pet's collar, tracking nearby movement and opening only when your pet approaches the door. Because the door stays closed until your dog wants to go out, it aids in keeping stray animals out and insulating your home to keep it energy efficient. Doors come in two sizes and three heights, and prices start out around $495 with an additional $45 cost for the specialized corresponding collar. A patio dog door allows your pet the independence to go outside exactly when they need to without ruining the aesthetic of your home or contributing to wear and tear like wall units can. Careful measurements of your pet and your patio door unit will result in a patio dog door that will give you plenty of use in the years to come.